I love these light little cookies. I substituted dark mint chocolate chunks for the chocolate chips though. I doubled the batch using a little less than 3 TBSP of maple syrup. I will add a bit more next time if using dark chocolate. Thank you for sharing this recipe. oh dear!! they actually are not runny although I melted the coconut oil !! very soft, so nice!!!! Hi! it’s really weird.. I followed the recipe exactly and my batter was just super dry… it didn’t stick at all. Am I doing something wrong? Used the same ingreds but no good? I doubled the dose and We had 6 medioum cookies. i was a bit worried initially as the batter was quite oily but cookies kept their shape during baking! Why are the ingredients different in the video vs the written recipe for coconut chocolate chip cookies. E.g.4 tbsp coconut oil vs 2 tbsp cocnut oil…which is the correct one? I was skeptical before making them, but they turned out amazing! They held their shape and didn’t fall apart for me (definitely let cool off a bit). I mixed it all together with a wooden spoon and it worked well. The coconut oil wasn’t completely solid, but it wasn’t liquid either…it made a perfect cookie dough (texture so close to a regular chocolate chip cookie dough). Made small, teaspoon sized cookies. Hit the spot!! Will be making these again. Thank you for the recipe! I will try it next week but i am sure its great. Hi! I’ve never used coconut flour before. I’ve heard it’s very good at absorbing liquids. I would like to substitute the honey/syrup in this recipe with green leaf stevia that I grew and dried. Do you know if that will work? Should I add some water? Hello! This looks really good, but I have a question. Why the need for a blender or food processor when making this? Can’t I just mix it? The measurements seemed wrong. Tried it exactly as above in my blender and not enough ingredients to mix all the way. I then made it in a bowl and used my hand mixer and doubled the ingredients and barely had enough to make 8 cookies. Hopefully they will taste better than they looked. Hi! This might be a stupid question but i’m asking anyways… since this is egg free, can I eat the dough just like cookie though? Well, I tried this recipe using honey, and they came out of the oven totally flattened and unedited after 10 min. I know I followed the directions well, and my coconut oil was room temp, so unless it was due to the temp of ingredients, I am not sure where I went wrong. Maybe I didn’t chill long enough…. Hey love the cookies they are amazing however I only managed to make 6 out the portions u gave…and they were tiny ones at that too..are they suppose to be bitesize?? Just made these cookies. Doubled the recipe for more cookies. I was able to get 21 cookies. I had no problem with any phase of baking. They are so light! I wonder if those who had a liquidy batter melted their oil first or blended the batter too long? I used my pulse button on my processor intermittently about 6 times and the batter held. I kept the oil solid also. I made these cookies and my mom loves them! Me too! My six year old has a thing about looks but she thought they were good(ok). She is has to acquire the coconut taste. I have to be as productive in adding treats, as well as tasty foods to my true gluten-free diet for my family, especially my one year old with food allergies. We are working on healing the gut. Could essential oils benefit her? I would love to know more. I have some, but I am not so keen on how to utilize them. Turned out great! Thank you! I just made these exactly per the recipe. They turned out fabulous. I know why they’re small…very rich! Very satisfying! My kids love them. Great recipe. Thank you. Cookies are sooo awsome. I tripped the ingredients and got 17 mini cookies. I used 1 table spoon of reg.maple and 3 &1/2 tablespoons of sugar free maple syrup. Nice cookies I’m happy. I did everything on here, but why does my cookie taste all powdery?? How many cookies does this recipe yield? Hi! This might be a stupid question but I’m in Australia and I just wanted to clarify, is it 350 degrees Fahrenheit or Celsius? These look great by the way! 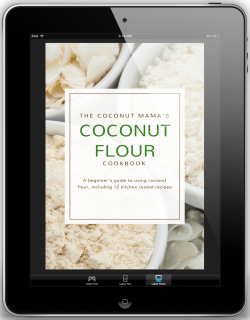 I’ve tried several coconut flour recipes and this is the best yet! Thank you so much!! Just whipped these up! Nice & easy, leaving cookie batter you can eat:) I added a little more flour and walnut pieces. Def let them cool before eating! I’m new to GF baking. (I’m also dairy free.) And so far GF baking has been super intimidating. These turned out great! I love how simple and quick they are to make, and I love that this recipe just makes a very small batch. My husband (he’s not GF) even approved of them! I recommend sticking them in the freezer/fridge for several minutes before scooping them onto the cookie sheet. Hi! What does the cookie taste like at the end? Do you have the nutrition? Also whats the texture of the done cookie? Am I reading this wrong- only 2 tablespoons of coconut oil and 3 tablespoons of coconut flour. Seems like you’d need more than just a couple tablespoons of everything. I really want to give these a try, but want to make sure I use the right amount. Thanks! These look amazing! I have 2lb of coconut flour! Now I know what I’ll do with it! Thanks! I made these tonight and they were yummy. I ended up tripling the recipe and that gave me 12 normal size cookies. I suggest adding more flour as they are a bit runny. I made these with brown rice syrup and they were sweet enough for me. I use coconut flour in many of my recipes, and have found, thru alot of trial and error, that all coconut flour is not created equal unfortunately. This could be the issue with alot of the problems people are having. What brand of coconut flour do you use Tiffany? I just made these and they came out fantastic! I tripled the recipe and used a 1/2 teaspoon to measure out the cookies. They are tiny and perfect! It made about 50 🙂 thank you! I just baked these cookies, The flavour is really good, i love it! i have to say i doubled all the ingradients and i got 14 very tiny cookies…so i really don’t see how you got 12 small cookies out of just three tablespoons of flour…also i had to add some flour as they got quite runny, it think maybe too much coconut oil…they break very easily, not good for guests, they do not look very nice, mostly came out as crums, but they taste good anyway. Yummy! I love the simplicity. Thanks, I can’t wait to try these. The key to these cookies is using cold, solid coconut oil. Even after mixing the dough, place the bowl of dough in the freezer for a few minutes. You need to have a thick, solid dough going in the oven to maintain the round shapes shown in the pictures above.. The cookies are pretty good. We liked the cookies small, as coconut flour can tend to be like eating a spoon of peanut butter – rather thick and clingy in your mouth. We used expeller-pressed coconut oil that doesn’t have a coconut flavor, so the chocolate chips really make the cookies. 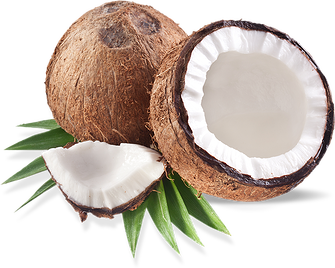 Coconut is a nut, and could cause anaphylaxis in people allergic to tree nuts, like my son (who nearly died after eating a bit of coconut back when I mistakenly thought it was a fruit). PLEASE don’t label things nut free that absolutely are NOT, it can cause some well-meaning person somewhere to put someone else in great danger. Coconut is not a nut. It is considered a seed or a fruit. I know several people who can eat coconut who have nut allergies. Only 3 tablespoons of flour…is that right? Yep! Coconut flour absorbs a lot of liquid. Just a couple days ago I was put on a GAPS diet. High protein low carb diet!! I have struggled to find things to eat and of course get through the holidays. Your website has helped me a ton and I wanted to say, “Thank You” One question, if I am only allowed one fruit a day do you think I could skip my fruit and add a cookie or should I wait for a while to add these in…..They looked delicious and I was hoping for a treat to have a Christmas. I am concerned because I was told NO sugar! My understanding is that GAPS is not a low carb diet. It’s important to get enough carbs on GAPS because you can really mess up your thyroid if your not careful. I know honey is legal, but I’m not sure what stage you can introduce it on. Here are some references that may help you. Shara » You’re probably right, Shara! Is this recipe for mini cookies? I doubled the recipe and it made 7 tablespoon size cookies. They are really yummy, thanks! I have to agree with Melanie, I’ve made them twice now and they are a runny mess for me. The edges burn and they spread crepe thin. Should I add more coconut flour? Am I adding too much honey? I do the 1 1/2 tablespoon, maybe next time I’ll just try 1 tablespoon and see if that helps. Hmmm I’m not sure what your doing to make the batter runny. Maybe you could refrigerate the dough before baking it? How much easier could a chocolate cookie recipe be? These look fab!!! Thanks so much for sharing! The same thing happened to me. So I took them out of the oven and added some more flour and made the mixture into a giant cookie. I then cooked it for an extra 10 minutes… it was okay… edible… but not exactly an intact cookie. More like a soggy clump. These are amazing! Just made them for the family and even my dad who isn’t really a fan of anything grain-free gobbled these up and asked me to make more! This is so clever!! What a great idea to make these dairy free and add the homemade chocolate chips. They look delicious, and I can’t wait to try this recipe! I just made these and I had to scrape to get 7 teeny tiny cookies. Then they burned at only 7 minutes. They smell good though.